Starting from 20th December 2017, Australia has started bringing changes to its immigration policies. They started with changing their name and bringing different departments under one roof, and now they have announced the new policy for required proof of funds for new student visa applications. Ideally, International students who intended to pursue their studies in Australia have to prove their financial sufficiency to study in Australia. 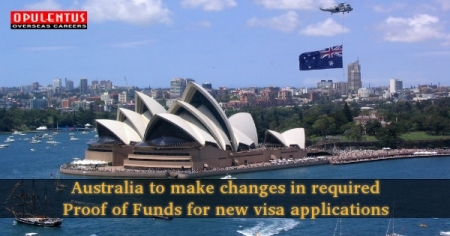 However Australian immigration has announced to bring changes to it, which will come into effect starting from 1st February 2018. The new fund's requirement has seen a 2.3% increase in the current financial evidence. From 1st February 2018, the main student financial evidence will be AUD $20,290; Partner and Spouse AUD $7,100; Per Child AUD $3,040.